Urban designer Hugh Nicholson said, “the genius loci doesn’t exist without people”. He was part of a small but fascinating panel chaired by Lara Strongman that brought writers Fiona Farrell, Anna Smaill, Hamish Clayton and of course, Hugh himself, to discuss the notion of Imaginary Cities as part of Word Christchurch’s Shifting Points of View sessions at the Christchurch Arts Festival. I found myself musing on this phrase and how it responded to my own jarring sense of multiple realities in this city; but also to the rapidly changing blueprint of a landscape, one that was subject to dramatic temporal and spatial opportunities for its people. Such are the mechanics of the world into which this year’s festival has been birthed. Far away in Auckland it was easy for me to speak to director Craig Cooper and visualise this changing, dynamic and potent environment. Of course, it’s always easier to romanticise when you’re at the other end of an imaginary telephone line; it’s an umbilical cord that despite the human connection is easily severed. We spoke of canvases, not blank but certainly emptier than before, and the carving of new narratives through an eclectic range of genres and expressions. And that was exactly what the festival offered on its opening weekend. From the outrageously appropriate re-telling of how Kate Sheppard won women the right to vote in That Bloody Woman to the charms of Puck and Bottom in A Midsummer Night’s Dream, the stories were fresh, contemporary and relevant. Equally, stories of a Middle Aged Man in Lyrca (MAMIL) a cast of fabulously endearing marionettes in Ronnie Burke’s Daisy Theatre and the delights of recognising love stories that start in a field of flowers with Daffodils all ensured sell-out seasons. Add to the mix the throbbing beats of Lord Echo and the aural delights of listening in to some deeply absorbing conversations by Word Christchurch and you have a satisfying sensory feast spread across three glorious days of artistic indulgence. But the opening weekend offered more than just a glut of creative inspiration. Because entrenched behind shipping containers and along makeshift fences, as you made your way across the veritable shifting stones (this was done in my inappropriate footwear I confess) the city’s juxtapositions offered a series of contradictory realities. Everything is real yet as is quintessential of festivals, all is fleeting. 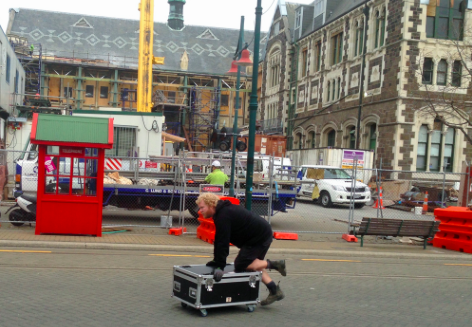 It is these incongruities that make the festival in Christchurch such a unique space. Adjacent to the Arts Centre, currently undergoing repair and only a short work from the RESTART MALL, there are visible signs of a city rebuilding itself. Surfaces along Manchester Street are constantly smoothed; evidence of Leigh’s construction machinery towers over the skyline with its indomitable cranes and despite its apparent placidity even the Avon rover must observe the changing face of Oxford Terrace with some curiosity. Nobody discussed the Cathedral in too much detail, it’s still an unspoken bone of contention but the city and her tremendous network of arteries continue to throb as traffic flows outwards. It is in this environment, vulnerable yet so deeply resilient, that a festival has so much to offer. And the 2015 festival suffers no shortage of offerings that will not speak, sing in fact, back to the people of the Garden City. There is a huge variety of work from the home grown story of Scribe who alongside his father and brother share the stage in The White Guitar and the Free Theatre’s most recent collaborative work pays tribute to the artistry of listening in the Kagel Project. There are the Songs of the South blending folk country and root by some of the most talented locals; cabaret with Lady Rizo, Hamlet the Video Game; the delightful Duck, Death and the Tulip; for opera lovers, Love Divine and an array of many other excellent international acts. Concert music, installations, dance extravaganzas, comedy, puppetry, talks and conversations and a plethora of different moments. It is a stirring programme where the diversity in the arts reaches out to speak to the city and the people, an audience that is acknowledged but also welcomed into changing spaces and alternative ways of telling familiar narratives. No matter who you are girl or boy; young or young at heart; Christchurch has changed in ways that will continue to surprise and perhaps even astonish – but we are all part of the cities’ story.